You may rock a shirt and tie every day, but odds are you’re doing it wrong. In this simple match-up lie many pitfalls. Do your colours clash? Is your fabric rubbing up the wrong way? Do your patterns look more like something from a student’s bedroom walls than a Pitti street style shot? Matching (or intelligently contrasting) shirt and ties can make even staid outfits pop, whether you’re mixing prints or taking a more pared-back approach. Prepare to reassess your neckwear. If you keep your base neutral, then you earn leeway to play with what’s around your neck. “You can’t go wrong with any tie on a white base,” says Alex McCart, Selfridges formalwear buyer. But that doesn’t mean you need to steer novelty. On a plain background, even subtle patterns will pop. Not that a white shirt works with the first thing you pull out of the drawer. “Stay away from bright ties with dark suits,” says McCart. Instead, stick to the same colour as your tailoring to pull your look together. Once you add colour, tonal dressing offers an easy win. “A bright tie stands out too much,” warns McCart. 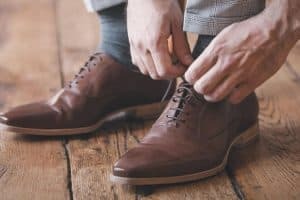 Instead, the tie you choose should “always be a couple of shades darker than the shirt.” This draws the eye down your torso, lengthening your physique. To mix colours, look to the colour wheel, says Savile Row tailoring consultant, Mikhail Korausch. Colours either opposite or adjacent, like blue and orange or yellow, pair happily. But obey the same light-and-dark rules as for tonal dressing – a pale blue shirt and burnt orange tie beats navy under tangerine. Most of your tie rotation is probably glossy, but there are alternatives to silk. 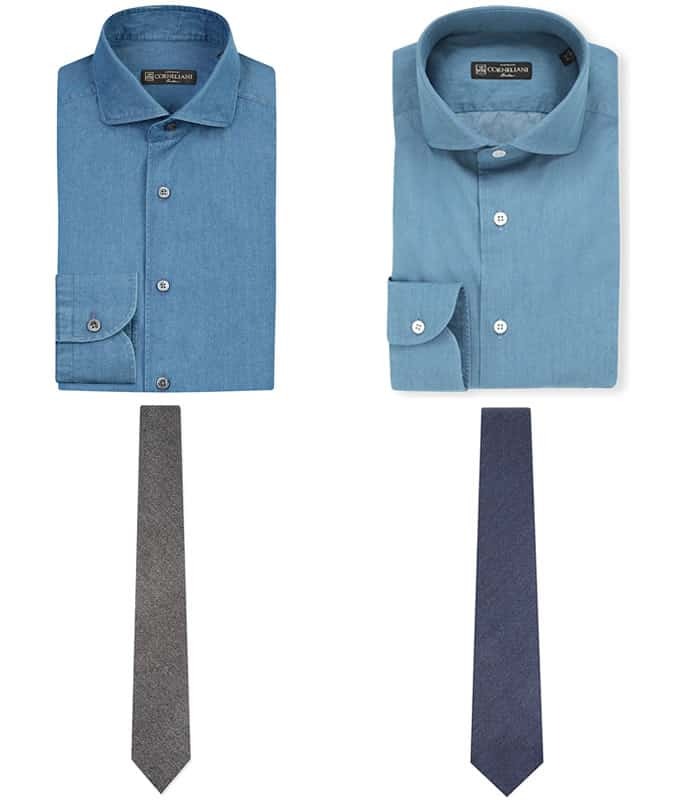 For less formal dress codes, a chambray shirt injects your look with texture. Add a herringbone overcoat for a texture-blending power move. 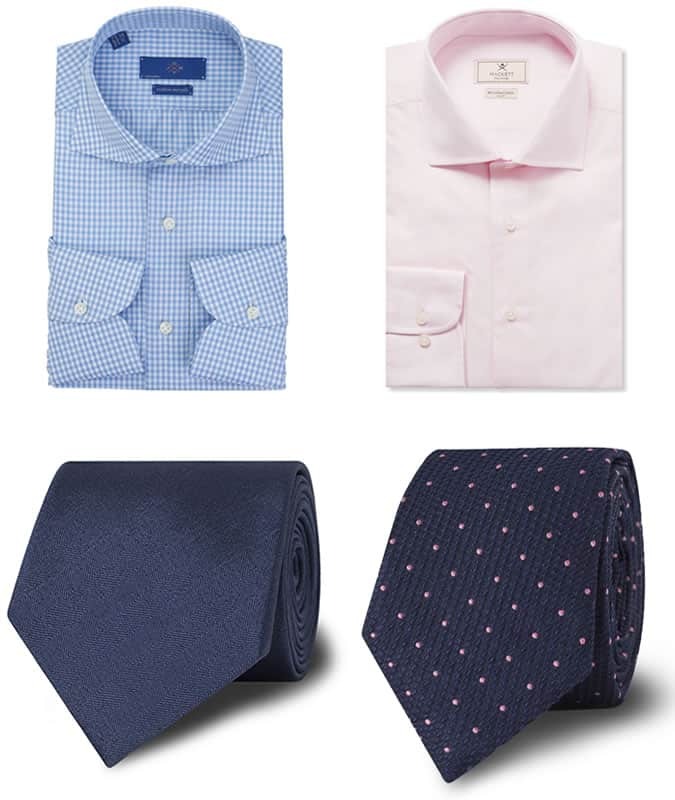 Then echo its shade in the accent in your tie; a salmon shirt pairs with a pink-on-navy polka dot, or wear a blue gingham shirt with solid navy. In the right hands, clashing elevates your look. To pair patterns without looking like a Magic Eye picture, you want to contrast design, but match colour. That means fine patterns on your shirt, then a bigger pattern for your neckline, or vice versa, says Korausch. Think gingham with a wide-striped repp tie, or a Bengal striped shirt paired with larger paisley. Keeping colours tonal will help pull the patterns together, says McCart. Echo a pink checked shirt with a tie that has its most prevalent colour as an accent, like blue stripes with pink piping. And maybe reach for a white pocket square over tartan. 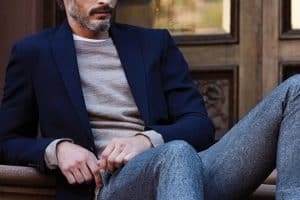 The Best Men’s Belts Guide You’ll Ever Read Buckle up for this year's most stylish waist management How To Wear A Roll Neck In 6 Stylish Ways Dress like a high-roller in this season's most premium knitwear choice Male Body Image: The Naked Truth Be honest, how happy are you with your body?